Combine powdered sugar, almond meal and cocoa powder in a food processor and give it a few quick buzzes to mix evenly. Sift. Whisk egg white with 2 - 3 drops of lemon juice until soft peaks form. Add in caster sugar in 3 lots, beating well after each addition. Beat on high until stiff peaks stage. Fold in sifted mixture and color gel. Do not overmix. (It's been recommended to have no more than 40 folds). Line trays with parchment or baking mat. Fill piping bags. (I didn't use a piping nozzle. I simply snipped off about 2 cm from the tip). Pipe even rounds of about 1 1/2 - 2 cm in diameter; it will spread a little. Leave for about 1 - 2 hours to form a crust. You'll know when it's ready when the tops are dry to the touch. Bake in a preheated oven of 150˚C for about 12 mins. Remove from oven and let sit for a minute or two before gently lifting the macarons from the parchment with a flat spatula. Cool on racks. When cool, put a dollop of your favorite filling on the flat side of one shell and gently sandwich another together . Can be stored in the refrigerator for a few days, but allow about 15 mins at room temperature before consuming. 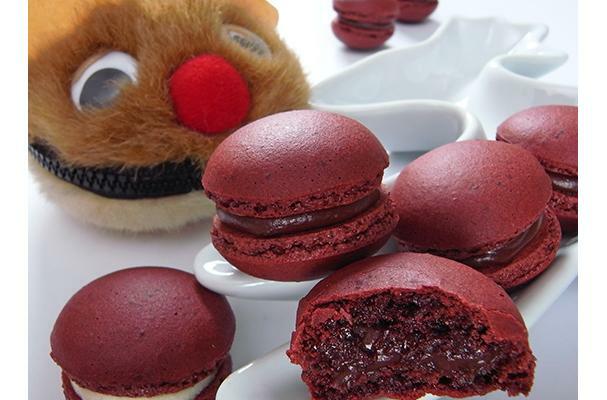 A chewy red velvet macaron with a chocolate ganache filling.